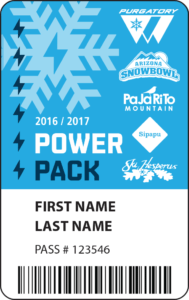 Visit Purgatory or any of our five southwest resorts—including Purgatory Resort, Arizona Snowbowl, Hesperus Ski Area, Pajarito Mountain Ski Area or Sipapu Ski & Summer Resort—for as low as $60 per day with Power Pack. Available for purchase exclusively at the retail partners below. Power Pack card comes pre-loaded with 6 punches. Each Purgatory or Snowbowl visit equals 2 punches, and each Hesperus, Sipapu or Pajarito visit equals 1 punch. Mix and match however you’d like. Power Pack is perfect for those who plan to ski at least 3 days at any of our five resorts. Bookman’s Sports Exchange 3330 E. Speedway Blvd. Easton’s Ace Hardware 6902 NW Cache Rd.